Product information "HAIX Fire Eagle Pro"
CROSSTECH® laminate technology, waterproof and breathable. Abrasion-proof lining fabric for optimised climate comfort at all times of the year, and especially when frequently moving between indoors and outdoors. Excellent penetration protection against blood and other bodily fluids (thus preventing ingress of viruses and bacteria). Enhanced protection against chemicals. Anatomically shaped, ultra-light toe cap made from fibre-reinforced synthetic, conforming to the highest safety standards. TPU cap with special profile for longer service life. Name field for boot labelling. Three different boot inserts enable you to adjust the boot to the width of your feet. Micro-dry lining around the upper end of the shaft allows moist air to be released with every step while fresh air enters the boot through the vent holes along the shaft and tongue. 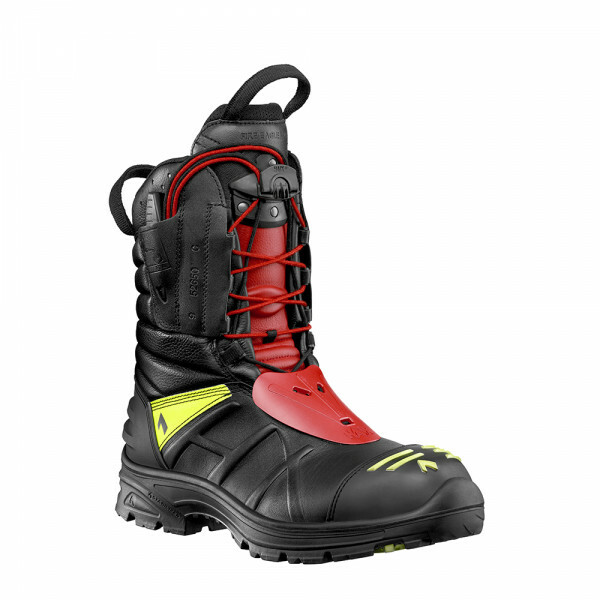 Patented two-zone lacing system for quick and optimal lacing adjustment and correct fit of the boot. Added safety thanks to integrated instep protection.